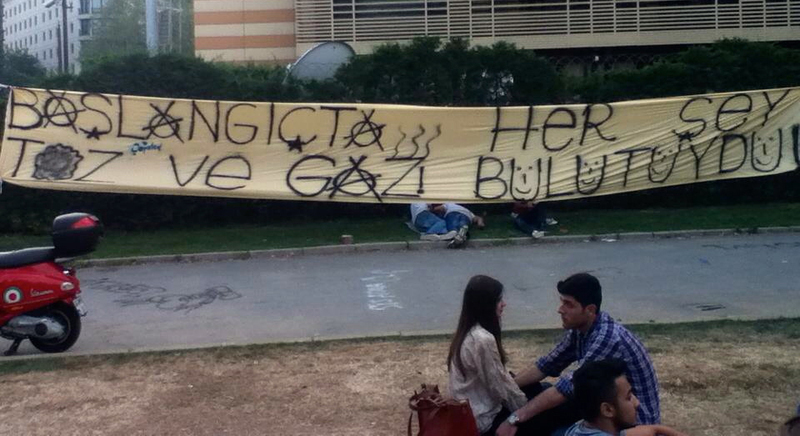 Protest banner near Gezi Park – “In the beginning, everything was a cloud of dust and gas” – photo by the author. Guest writer Paul Benjamin Osterlund is a graduate student of Turkish Studies with a specialization in Urban Studies at Sabanci University and writes from Taksim Square. “In the beginning, everything was a cloud of dust and gas” – spray-painted on a banner hung just behind Gezi Park near the Divan Hotel, the slogan is a playful rebuke to the clouds of teargas that hung around the Taksim and Beşiktaş areas of Istanbul following the excessive violence inflicted by the police upon protestors on May 31st and the following days. After protestors camping out in the Istanbul park were awoken by a brutal surprise attack from police, what began as a small series of protests in defense of the park, as vestige of shrinking public space in Istanbul, spread like wildfire across the nation within hours. I felt the sting of the tear gas immediately as I hopped off the ferry and onto the Kabataş pier, just downhill from Taksim Square. After meeting a friend, we soon found ourselves in the midst of an intense standoff between protestors and police on Istiklal Avenue, Istanbul’s busiest street. The cops were indiscriminately firing off tear gas canisters directly into the packed crowd, which would split like the Red Sea as the metal cylinders whizzed by. There were thousands of people in the street attempting to reach Taksim Square and Gezi Park, areas blocked by riot police with large tank-like vehicles spraying pressurized water. Frontline protestors retreating from the gas were immediately replaced by others approaching from behind. Suddenly surrounded by two or three smoke-billowing canisters, burning my eyes and filling my lungs, I stumbled into a vacant building. Unable to breathe or see, I crawled up the stairs hoping there was air at the top. That twenty-second sap of oxygen was the opposite of a panic attack: instead of shutting down, my body was doing everything it could to stay alert and in motion. After taking refuge at a friend’s nearby studio for a few hours, I made my way back towards Taksim Square having heard the police had retreated and it was safe to re-enter. The “all clear” alert proved false as the police had not only stayed but were deploying a more potent chemical, which made eyes and skin burn, body ache from head to toe, limbs numb and voice shaky. Retreating protestors were falling to the ground, passing out and vomiting. The sinister clouds of gas that defiantly clung to Taksim form the clearest memories I have of the evening. 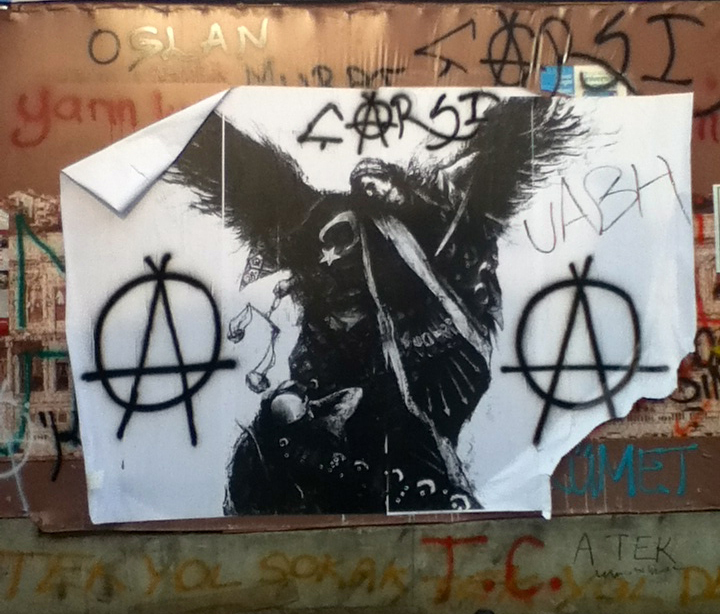 OccupyGezi Banner – photo by the author. In spite of the gas, protestors held ground. In the following days, police retreated from Taksim, which was promptly barricaded on all sides by protestors using materials confiscated from police, torn-down billboards, bricks from the street, whatever they could get their hands on. Gezi Park became an autonomous zone, complete with an ever-circulating regiment of volunteers collecting trash, distributing medical supplies and water, and serving free hot meals. A makeshift library was constructed in the park and daily yoga lessons were held; even a full orchestral concert was performed. The atmosphere was hopeful, lively, safe, and jubilant. Prime Minister Erdoğan, however, gave his own spin to the entire affair claiming the protestors were extremist, marginal groups, when demonstrators represented practically every facet of Turkish society. He asserted that a police officer was martyred in his efforts to stop the protests, when in actuality he had fallen from a bridge and said that protestors were drinking beer in the makeshift hospital established in the Dolmabahçe Mosque of the Beşiktaş neighborhood, although the mosque’s imam refuted the accusation. By maintaining a defiant, belligerent tone throughout the events, Erdoğan deceitfully delegitimized the protests in an attempt to solidify his power base. The morning of Tuesday, June 11th saw the police return to Taksim, ushering in another wave of altercations suspected to be orchestrated by undercover agents. The police had been sent to clear the numerous flags and banners that had been affixed to the Atatürk Cultural Center and the Republic Monument but Molotov cocktails were thrown at riot police by a small handful of men widely rumored to be undercover police. It just didn’t add up. It did not fit the entire mood or aim of the protests and ran counter to their positive, collaborative and peaceful character. In the previous periods of heightened police violence, no such firebombs had been thrown. Then why now? Having spent the previous week in the park, I witnessed this live feed from home until it became too much to watch: the scene was grim and cruel, in stark contrast to the high hopes and enthusiasm of the crowd the previous week. 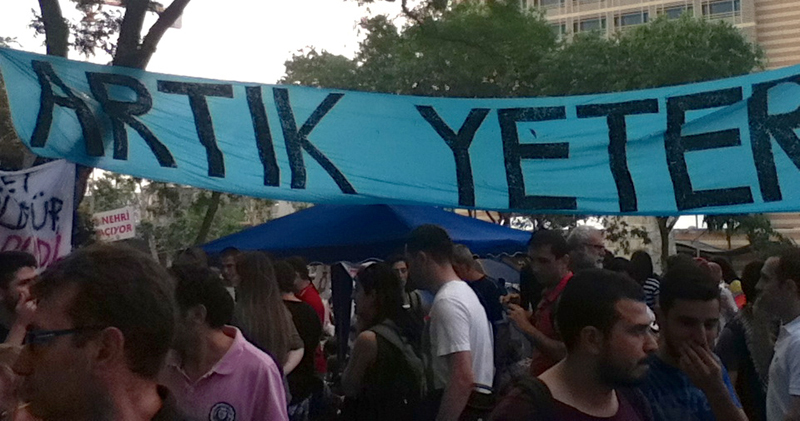 Protest banner in Gezi Park – “Enough Already” – photo by the author. I called a friend at the park to make sure she was ok and went to sleep; the gravity of the situation combined with rum to chase my feelings of despondency had cast its own cloud. When tear gas is deployed in a crowd, it compromises one’s senses and creates an environment of fear. Prime Minister Erdoğan has spent the past two weeks doing the same thing with his threatening, iron-fist rhetoric along with his regiment of lies and manipulation of events. However, those demanding clarity and transparency have not gone home. 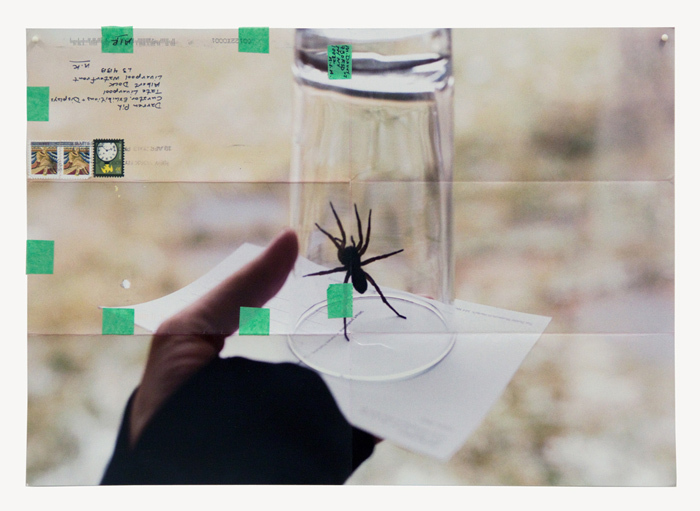 Guest writer Paul Benjamin Osterlund’s companion piece “Questionable Consensus” can be found on Shifting Connections. Exaggerated. Opposition party and extremists are look like asteroids around the cradle of civilization.